Presentation by AfDB (Mr Philip Gareth) on insights and empirical findings arising from recent studies in Eastern Africa. Presentation on the SWITCH Africa Green – SEED initiative (SAG-SEED Replicator Programme) by Ms Magdalena Kloibhofer. Case Study 2 by Ms Magdalena Kloibhofer: SEED winner project involving a grassroots eco-enterprise. 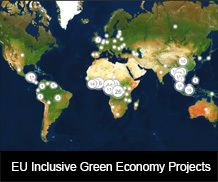 Brief interventions on Green Economy Policies in Rwanda and Kenya by respective EUDs.